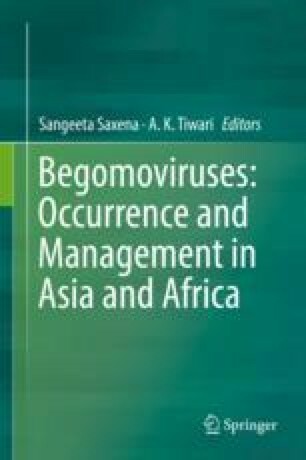 The whitefly-transmitted begomoviruses (family: Geminiviridae) emerged, during the late twentieth century, as serious pathogens of many vegetable crops across tropical and subtropical regions of the world. This importance is due to the economic impact of the diseases they cause (Morales and Anderson 2001). Tomato yellow leaf curl virus (TYLCV) refers to a heterogenous complex of geminiviruses (Czosnek and Laterrot 1997) vectored by the whitefly, Bemisia tabaci, that infects tomato (Solanum lycopersicum L), pepper (Capsicum annuum), potato (Solanum esculentum), tobacco (Nicotiana tobacum), several dicot weed and ornamental species (Green and Kalloo 1994; Polston and Anderson 1997; Ramappa et al. 1998; Al-Shihi et al. 2014a). In tomato and pepper, disease symptoms including leaf curling and yellowing, reduction in leaf size, and plant stunting are most common if plants are infected in early growth stages (Green and Kalloo 1994; Pico et al. 1996). TYLCV is a serious tomato production constraint in tropical and subtropical Asia (Green and Kalloo 1994; Zeidan et al. 1998). In some ornamental plants like petunia when infected with begomovirus, mosaiclike symptoms can be seen (Al-Shihi et al. 2014a). Leaf curling is the most common symptom induced by begomovirus infection that can be seen in other crops such as radish (Al-Shihi et al. 2017b), papaya (Ammara et al. 2015), and cotton (Briddon et al. 2001).